As with all our CanDrive range of Minibuses you may be able to drive it on a car driving licence - conditions apply. CanDrive Maxi is IVA tested where applicable, is provided with an IVA Certificate and has been designed and / or adapted to enable you to drive it on a car licence - conditions apply. All weights, dimensions and signage are IVA compliant and conversions on new vehicles can, where applicable, be first registered as a minibus after inspection by DVSA (formerly VOSA). We build minibuses to a variety of Type Approval regulations including but not limited to COIF (Certificate of Initial Fitness) and IVA. Should you place an order with us for a CanDrive Maxi Minibus we can set up an agreement for a minibus lease whilst you are waiting for delivery of your new minibus. 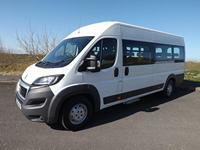 £112.48 per week, 5 year Hire Purchase, £7,498.50 deposit - this Peugeot Boxer Minibus is yours at the end of term. Please call for individual figures - to change the deposit level or repayment period. Business users - individuals please call for figures. Please not that you do not need to take up the finance option - all vehicles can be purchased outright without using the finance option.